Objective Bicuspid aortic valve (BAV) is the most common congenital heart disease. This study aimed to determine the prevalence rate of BAV in first-degree relatives (FDR) and the inheritance pattern according to different morphotypes and aortic dilation. Methods BAV probands were consecutively studied at eight tertiary referral centres. After sequential screening, FDR were included in the study. The BAV morphotype, aortic dilation and aortic phenotype were assessed by transthoracic echocardiography. Results Seven hundred and twenty-four FDR of 256 BAV probands agreed to undergo family screening. The prevalence of BAV was 6.4% in FDR (9.2% in men, 3.5% in women, p=0.002). Aortic dilation was diagnosed in 9.6% of FRD with tricuspid aortic valves (TAV), with a root phenotype in 2.7% and tubular in 6.9% and more frequently in the presence of arterial hypertension (OR 4.48; CI 95% 2.51 to 7.99; p=0.0001) and valvular regurgitation (OR 5.87, CI 95% 1.37 to 25.16; p=0.025). The heritability (h2 ) of BAV was highly significant (0.47; p=0.002); however, no concordance was observed among valve morphotypes. Aortic dilation heritability was not significant. Conclusions The BAV prevalence rate in FDR was low (6.4%) but aortic dilation was observed in 9.6% of FDR with TAV. The heritability of BAV was high without concordance in valve morphotypes, and aortic dilation heritability was not observed. Patients with BAV should be made aware of its familial pattern. The aims of this cross-sectional, multicentre study were: (1) to establish the prevalence rate of BAV among FDR using echocardiography; (2) to determine the inheritance pattern of BAV according to the different morphological types of valve, valve dysfunction and aortic dilation; and (3) to evaluate the presence and risk factors of aortic dilation in FDR. Patients with BAV documented by echocardiography were consecutively assessed prospectively at eight tertiary referral centres from 2012 to 2015. Exclusion criteria were a non-definitive diagnosis of BAV or the presence of another connective tissue disorder. From 852 patients included in our previous study,18 256 agreed to undergo family screening. Anamnesis, three-generation pedigree, physical examination and transthoracic echocardiography were performed in each index case. FDR (parents, siblings and children) were identified and invited to participate in the study. Those who finally agreed to be screened were included in the study. Approval of the hospital Ethics Committees was obtained for all participating centres. All participants provided their written informed consent. Anthropometric measurements (height and weight) were taken and body mass index and body surface both calculated in all patients with BAV and their FDR. Clinical history, presence of cardiovascular risk factors (hypertension, diabetes, dyslipidaemia and smoking), comorbidities and other associated cardiac malformations were obtained by personal interview at the time of echocardiographic study and completed from medical records. Three generations per proband were included, yielding a median of 3 (IQR 2–4) family members per proband. Transthoracic echocardiography was performed in all patients by experienced cardiologists using commercially-available, high-resolution ultrasound systems. Standard two-dimensional views were obtained and colour, continuous and pulsed Doppler were used to assess dysfunctional valve quantification according to European Association of Cardiovascular Imaging Standards. BAV was defined as the presence of two cusps and commissures, with or without partial or total raphe, in either structure. Each aortic valve was analysed and characterised in systole and diastole. Diagnosis was established by the systolic fish-mouth appearance of the orifice in parasternal short-axis views using a zoom tool. According to the fusion pattern of commissures, three morphological types were considered: type R-L, fusion of the right and left cusps; type R-N, fusion of the right and non-coronary cusps; and type L-N, fusion of the left and non-coronary cusps. Patients were categorised in three groups according to the degree and type of valvular dysfunction: a non-significant dysfunctional group, including normally functioning valve, mild aortic stenosis (AS) or mild aortic regurgitation (AR), an AS-dominant group and an AR-dominant group, when valve dysfunction was moderate or severe. The aortic root and ascending aorta were assessed using the parasternal long-axis view and at least three measurements were taken (sinuses of Valsalva, sinotubular junction and tubular diameter), at end-diastole from leading edge to leading edge.16 A non-standard parasternal long-axis window with an upper interspace and medial transducer position was obtained to visualise distal ascending aorta diameter. We measured the maximum diameter that can be obtained in these views. Echocardiographic studies were centrally analysed by two expert ecchocardiographers (AC and GM) using dedicated software (Echo PAC, GE Healthcare, Little Chalfont, UK). Quantitative variables are expressed as mean ±SD and qualitative variables in percentages. Intergroup comparison was made using Student’s t-test for continuous variables and Fisher’s exact test for qualitative variables. When the distribution was not normal, the Mann-Whitney U test was used. The 95% CI was calculated. Logistic regression was used to calculate the odds ratios and confidence intervals. A p value <0.05 was considered significant. Statistical test for intergroup comparisons where chosen under the assumption of independence between groups. These analyses were made using the statistical software programme SPSS V.9.0 for Windows. Additive genetic heritability was calculated with the SOLAR genetic statistics package. This software calculates the fraction of the total variance that can be explained by additive genetic variance. The method compares the sporadic model and the polygenic model based on log-likelihood values. A subset of the whole cohort included in this work was used for heritability analysis. In order to have homogeneous pedigrees, only families with proband’s siblings were included. The resulting subset was composed of 153 probands and 236 siblings. Heritability power was calculated with h2power command of SOLAR software with 10 replicates as the power to detect the corresponding observed heritability at a significance level of 0.05. Two hundred and fifty-six BAV probands from a BAV database agreed to undergo family screening. Through sequential screening techniques, 1253 FDR were identified as candidates for inclusion in the study. Of these, 237 (18.9%) had died and 292 (23.3%) were not available (refused to participate, changed residence or did not attend appointments). Finally, 724 FDR were included in the screening echocardiographic study (figure 1). The mean age of FDR was 41.7±18.7 years and 49.2% were males. Forty-six (6.4%) were identified as having a BAV, 218 probands had no relatives with BAV, 31 had one relative with BAV, 6 had two relatives with BAV and 1 had three relatives with BAV. A new affected member was identified in 14.8% of the families (46 BAV in FDR distributed in 38 families). FDRs with BAV were more frequently men (71.7% vs 47.6%; p=0.002) and more often hypertensive (27.9% vs 13.2%; p=0.012) (table 1). Representative scheme of study population. BAV, bicuspid aortic valve; FDR, first-degree relative. Characteristics and BAV morphotypes in probands are shown in table 1. BAV morphotypes among relatives were as follows: BAV R-L in 34 (73.9%), BAV R-N in 11 (23.9%) and BAV L-N in 1 (2.2%). No significant relationship was found among probands and relatives according to BAV morphotype. Pure BAV without raphe was present in 26.1% of FDR with BAV with no significant differences with the probands. Regarding valve dysfunction, 45.7% of probands had dysfunctional aortic valves (19.5% AS and 26.2% AR), while 13% of FDR with BAV had dysfunctional valves (4.3% AS and 8.7% AR). Aortic dilation was more frequent in FDR with BAV compared with FDR with TAV (47.8% vs 9.6%; p=0.001) (table 1). Dilation of the tubular ascending aorta was more frequent in FDR with BAV compared with FDR without BAV (20 (43.5%) vs 51 (7.5%); p=0.001), while dilation of the aortic root was similar between groups (2 (4.3%) vs 14 (2.1%); p=0.329). The ascending aortic phenotype also appeared more frequently in the FDR with BAV group (19 (41.3%) vs 47 (6.9%); p=0.001), but no significant differences were observed in the aortic root phenotype. A dilated aorta ≥45 mm was present in 6.5% of FDR with BAV and 0.4% of FDR with TAV and a significantly dilated aorta (≥50 mm) was present in 6.5% of FDR with BAV and 0% of FDR with TAV. Sixty-five individuals (9.6%) of the FDR with TAV had aortic dilation. They were older, with a higher prevalence of hypertension and AR, than those without dilation (table 2). History of hypertension and significant AR were more frequent in this population (OR 4.48; CI 95% 2.51 to 7.99; p=0.0001 and OR 5.87, CI 95% 1.37 to 25.16; p=0.025, respectively). Angio CT was performed in 22 FDR with aortic dilation from the coordinator centre. Mini-raphe (small fusion between cusps), not defined by TTE, was diagnosed in 9 of whom (figure 2), 5 of whom underwent 4D-MRI study which showed eccentric jet with an increase in rotational flow and axial wall shear stress. 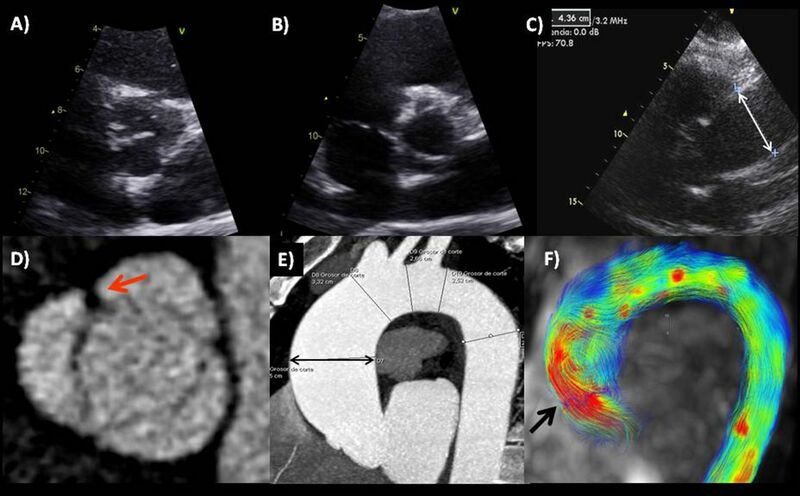 FDR of a patient with BAV showing a tricuspid leaflet valve in diastole (A) and systole (B) with ascending aortic dilation (C) in the bidimensional echocardiographic images. CT showed a mini-raphe (arrow) between left and right coronary cusps (D) and confirmed ascending aortic dilation (E). 4D-flow MRI revealed the eccentric direction of the aortic jet towards to the anterior wall of the ascending aorta (F). BAV, bicuspid aortic valve; FDR, first-degree relative. Significant heritability was found in our cohort of siblings for BAV (h2 =0.47; p<0.05) (table 3). Overall aorta dilation heritability was not significant (p=0.06) and, since BAV and aortic dilation traits were associated (online supplementary table 1), aortic dilatation h2 was calculated in siblings without BAV and in siblings with BAV. Aortic dilation heritability did not reach statistical significance in any case. Valvular morphotype in siblings with BAV (n=43) was not associated with proband morphotype (online supplementary table 2), and the BAV prevalence rate was not related to proband BAV morphotype (online supplementary table 3). This large multicentre study found the prevalence rate for FDR of BAV subjects to be 6.4%, being higher in men (9.2%) than in women (3.5%). A new affected member was identified by conventional echocardiography in 14.8% of families. BAV heritability was moderate and not related to valve morphotype. Aortic dilation prevalence in FDR with TAV was relatively high (9.6%). Most dilations were mild and more frequently observed in patients with hypertension. In one subgroup of patients with TAV with aorta dilation, CT defined the presence of a mini-raphe not previously diagnosed by TTE (41%). This is the most extensive series to analyse the BAV prevalence rate in FDR. The characteristics of BAV probands in the current series were similar to those of other studies. BAV was more prevalent in men (71% of cases), and BAV R-L more common than BAV-R-N (63.3% vs 26.2%, p<0.0001). Over 50% of our relatively young population (mean age: 46.4±16.4 years) had no significant valvular dysfunction. The prevalence rate of BAV in FDR was 6.4%, in the range of previously published data of 4.6%10 to 11%.4 5 14 21 Using a maximum-likelihood-based variance composition method, we estimated the heritability of BAV to be 0.47, suggesting that in this population, the determination of BAV is not entirely genetic. Taken together, these results suggest that there may be a significant but incomplete genetic basis underlying BAV morphology. Some previous studies reported that heritability for BAV and other left ventricular outflow tract obstruction defects ranged from approximately 0.7 to 0.9 (5–6). These values were slightly higher than those reported in our series; however, we analysed isolated BAVs excluding other associated congenital heart defects, and the prevalence rate of the disease was significantly lower in comparison with other studies. Though not the aim of the current study, mini-raphe (frustre BAV) was identified by CT in 9 of 22 cases (41%) with aortic dilation and apparent TAV by TTE. This interesting finding may widen our understanding of aortic dilation in FDR but should be interpreted with caution, as this was not the aim of our study. We hypothesise that these mini-raphes may disturb ascending aorta flow in a similar way to BAV24 (see figure 2). In a recent publication, surgical inspection of aortic valves in the setting of thoracic aneurysm and aortic insufficiency found very small raphes (ie, 3–6 mm in length) in valves initially considered to be tri-leaflet. These may have represented the fruste BAV form in 18/61 (29.5%).29 Although these mini-raphes were not diagnosed by TTE, some were identifiable with high-resolution true co-axial imaging by TOE, CT or MRI. This fruste BAV form could play a role in the aortic dilation of FDR with TAV defined by TTE. Although BAV is often identified incidentally in otherwise healthy, asymptomatic patients, it is associated with serious long-term health risks, including valvular dysfunction, infective endocarditis, significant aortic dilation and more exceptionally aortic.2 30 Given its prevalence, and the fact that significant complications occur in over one-third of cases, BAV has a high morbidity rate. Based on these data, guidelines recommend echocardiographic evaluation of all FDR of patients with BAV as class IIaC in search of aortic dilation and/or BAV.16 Data of the current study need to be considered in these screening recommendations. This study was conducted in families of patients with BAV attending tertiary centres; thus, our population may have a selection bias. 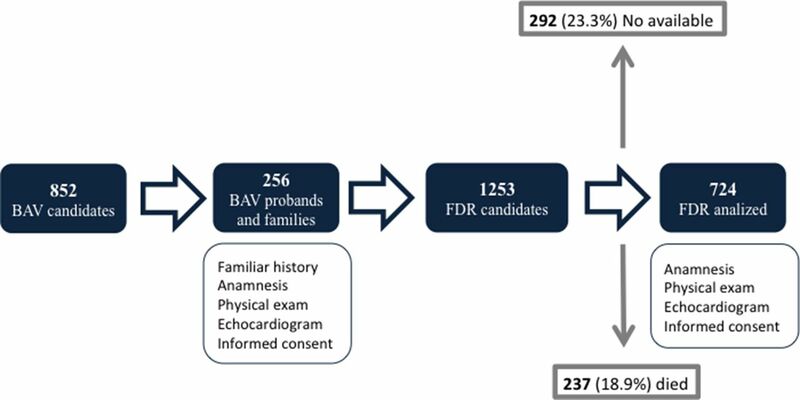 As described in other series,10 17 only a 30% of possible candidates agreed to undergo family screening, probably due to geographic reasons, lack of interest or considering BAV a benign abnormality. Pedigree was not obtained in all families and the genetic effect size (heritability) could not be estimated. The aim of the study was not to define mini-raphe prevalence. Therefore, only one subgroup of FDR with aortic dilation at the coordinator centre underwent CT study and this finding should be confirmed in further studies. The BAV prevalence rate in FDR in this large multicentre study was 6.4%, with no concordance in valvular morphotype. Aortic dilation was observed in 9.6% of FDR with TAV. The heritability of BAV was high without concordance in valve morphotypes but aortic dilation heritability was not observed. Patients with BAV should be made aware of its familial pattern, and screening of their FDR advised. Further studies by CT or MRI are required to elucidate the presence and implications of mini-raphe in FDR with TAV and aortic dilation. The prevalence of bicuspid aortic valve (BAV) in first-degree relatives (FDRs) varies from 4% to 11% in published series. While the presence of aortic dilation has also been documented, its inheritance pattern remains unknown. The prevalence of BAV was 6.4% in FDR and aortic dilation appeared in 10% of FRD with tricuspid aortic valve, and this phenomenon was associated with arterial hypertension and aortic regurgitation. The heritability of BAV is moderate and suggests a mostly genetic pattern, which is also not subject to BAV morphotype. Aortic dilation heritability was not observed. Aortic dilation is present not only in patients with BAV but also in their FDR. Patients with BAV should be made aware of its familial pattern. These data need to be considered in recommendations about screening. The authors would like to thank Christine O’Hara for help with the English language of the manuscript and Augusto Cesar Sao-Avilés for statistical analyses. Stout KK , et al.
. ESC guidelines on the diagnosis and treatment of aortic diseases. Eur Heart J 2014 35:2873–926.
. A pilot project of familial screening in patients with bicuspid aortic valve disease. J Heart Valve Dis 2013;22:150–5. Contributors All co-authors and collaborators agree with the final version of the manuscript submitted and in the information that I have included in the current form. Funding This work was supported by the grant PI11/01081 (Instituto de Salud Carlos III, Madrid). Ethics approval CEIC Hospital Vall d’Hebron. Collaborators BICUSPID investigators (see online supplementary appendix). This research was possible thanks to the collaboration of patients with BAV, their families and the staff of the following centres: Hospital Universitari Vall d’Hebron (Barcelona), Hospital Universitario Virgen de la Macarena (Sevilla), Hospital Universitario Virgen de la Victoria (Málaga), Hospital Alvaro Cunqueiro (Vigo), Hospital General Universitario Gregorio Marañón (Madrid), Hospital Clínico Universitario Virgen de la Arrixaca (Murcia), Hospital Univesitario 12 de Octubre (Madrid) and Hospital Clínico Universitario de Valladolid (Valladolid).